No need of tracking paper, get your documents signed online in minutes, not days. Know who signed the document and when. Store documents online for access anytime, anywhere. Gain valuable insights by making it easy to sign documents online. 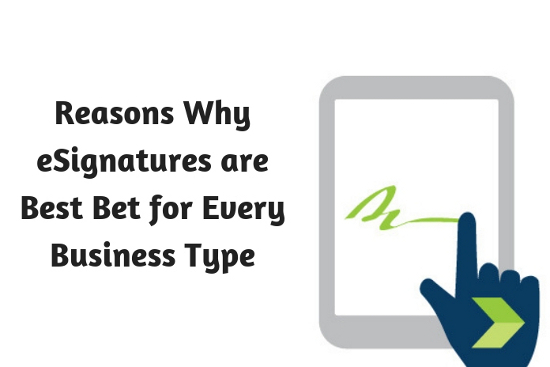 Despite of these benefits, are you wondering whether switching to eSignatures is right for your business. Let’s take a close look at some of the key benefits of electronic signatures. Sales contracts and agreements are always there and are considered as most important. Real estate transactions is one area where electronic signatures have gained tremendous acceptance. Electronic signatures can be adopted by companies of all sizes – SMEs and large enterprises. SMEs is more likely to negotiate with vendors, so it is important to lock the price and terms quickly once the agreement is reached. Instead of waiting hours or days, the agreement can be finalized within minutes. If customers require filling out forms or paperwork, electronic signatures are a must in your business. You can eliminate rekeying of data, which would save time and results in no errors. For project-based businesses, change is constant. Sometimes clients may simply change their minds in the middle of the contract term. By adding electronic signatures to change orders, you can avoid holdups and maintain a complete paper trail for review anytime. For businesses that deliver custom-made goods, the approval prior to manufacture is important. eSignature allows you to capture and store approvals with ease, so you can quickly move on to complete the order. Hiring a new person involves a lot of paperwork. The contract forms, benefits enrolment, joining letter, employee handbook and the list go on. All these documents can be handled securely with ease using electronic signatures. Non-disclosure agreements provide security, allowing you to do business quickly and easily. Signing through traditional paper and pen methods is highly inconvenient. With electronic signatures, signing can be done quickly and easily even from mobile device, enabling greater security and confidence. If partnerships with dealers, distributors or other sales channels is your business, electronic signatures makes it easy to do business with you. Electronic signatures make it easy to verify employees or child’s age by integrating with ID verification solutions. The benefits of eSignature solution are countless. With eSignature solution, you can upload a document, declare signers and recipients and send a secure link to the recipient. The recipient then signs the document and the process is complete. Electronic signatures are more secure than traditional paper documents. eSignatures are traceable i.e., you can track who signed the document, when and where they did. That is much enforceable than paper-based transactions. Today, even small organizations deal with different suppliers, customers and partners from multiple cities, and countries. eSignatures allow for remote authentication, making it more convenient than the traditional mailing and scanning. With eSignatures turnaround time is very less, instead of sending a document to one and getting it signed and sending it to others and repeating the process for all the signers, everyone can sign the document in seconds. This quick turnaround gives businesses greater versatility in time-sensitive situations. It can be frustrating to get the document signed again and again if they miss to fill out some vital information. With electronic signature software, you can enable mandatory fields, meaning you can ensure your documents are 100% complete every time. You don’t have to face the headache of tracking and resending documents again for eSignatures. Electronic signatures are more cost-effective than the traditional pen and paper methods. Not only you save paper, but also save postage, fax costs and time every time you require someone to sign a document. If you are still using paper-based signatures, now it’s the time to think about switching. Electronic signatures can transform your business for the better. SutiSign not only makes the signing process easy, but makes the process cost effective. With SutiSign, you can close business deals faster and in a hassle-free way. A major concern when signing documents electronically is security, so both the sender and signer should feel that sensitive data will not get lost. Considering the software that is complaint with ISO / IEC 27001, PCI and AES 256-bit certification can ensure your data is secure. Ideal solutions are those that monitor all the activities and alerts, if any suspicious activity is detected. Users should be able to sign on any device; meaning you should be able to create documents, edit and send them to one or more parties even from your mobile. SutiSign gives you the ability to sign documents from your mobile device, tablet or PC with ease. You can also take a snap of the signature and place wherever it is needed on the document. There might be scenarios you want to integrate other applications with electronic signature, which is why our electronic signature software comes with a bunch of integrations. The solution can integrate with Microsoft, Salesforce, Dropbox and many more to allow you easily switch between the applications. The best way to find out which solution works better for you is to simply try out. If you haven’t tried eSigning, its worth to give a shot so you can eliminate scanning, and printing documents, which makes your life much easier.